A method for characterizing and quantifying marine methane gas seeps along the U.S. Western Atlantic Margin was developed and applied to 70 free-gas seeps observed by the R/V Okeanos Explorer in 2012 and 2013, in water depths ranging from 300-2000 meters. Acoustic backscatter from an 18 kHz split-beam echo sounder and a 30 kHz multi-beam echo sounder provided information on the height to which the gas seeps rose from the seafloor. Profiles of the depth-dependent target strength and scattering strength were compared to models of the evolution of rising bubbles to help constrain the ultimate fate of the methane gas. To do so, a refined methodology was developed that decoupled the target strength of a bubble plume from the inherent background noise and reverberation in the ocean. This methodology was particularly useful for acoustically weak (i.e., low signal-to-noise ratio) seeps, and for examining the acoustic trends of seeps as their echo signature approached background noise levels. Comparisons of target strength profiles to models of bubble dissolution demonstrated that the parameters used in the model (e.g., gas transfer rate) are consistent with empirical observations. Liam received his BSME from UNH in May of 2013. He was accepted into a collaborative MIT-USGS-UNH project under Professor Tom Weber which focused on the analysis of acoustic backscatter data from methane seeps in the US Atlantic margin. 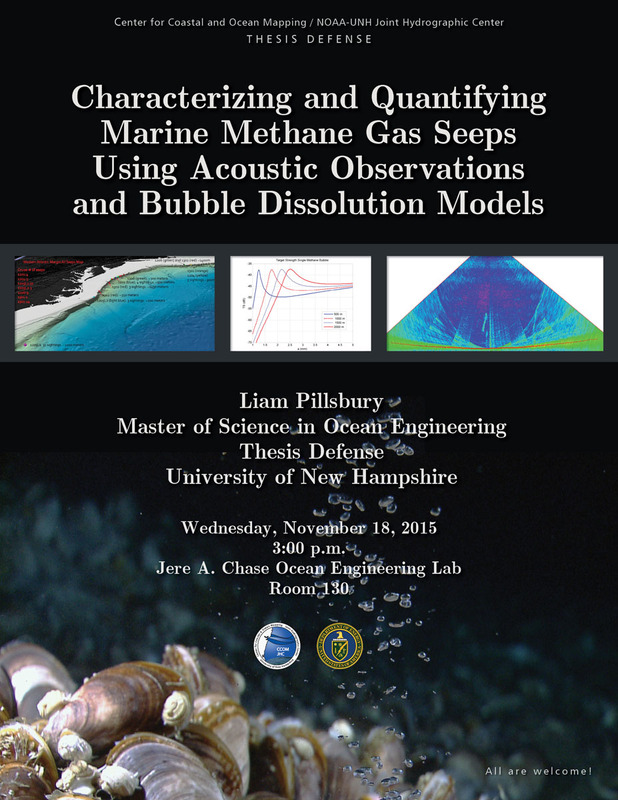 Liam’s interests lie in underwater acoustics, fluid dynamics and renewable energy resources.